30 minutes ago, Théo (the historical sampler of the Yenisei) tooks the hovercraft for the Igarka airport to go back in France. 10th of June 2016, 10h30, Spring continues to settle in Igarka and gives to the Yenisei banks greenish colors that would almost make us think to “La prairie des Filtres” (special mention for my friends in Toulouse). The flood peak has now passed (05/06) and we sampled each day the last week for ensuring to have a maximum amount of data on this so particular period. 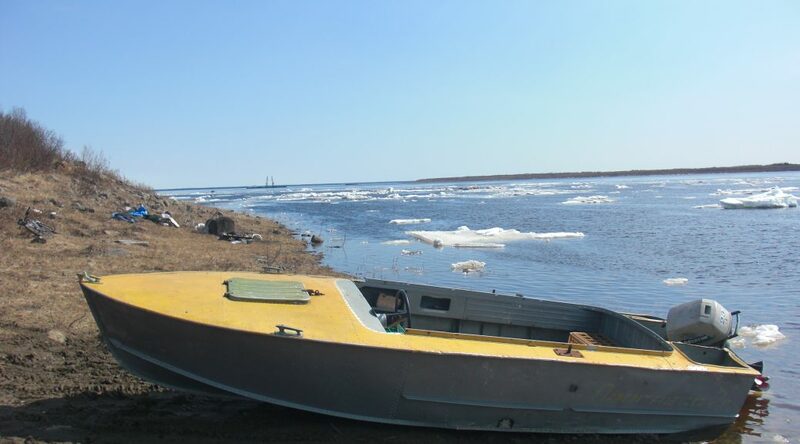 Yenisei waters were black, full of organic matter and it was an amazing spectacle to observe remaining ice breaks from the branch of Igarka leaving to Arctic ocean. From now, we reduce the field sampling frequency to one or two times per week but others field works are coming. Igarka will also serve as a calibration site for the SMOS (Soil Moisture and Ocean Salinity) satellite whose the mission is driven for part by a team of CESBIO (Centre d’Etude Spatiale de la BIOsphère) in Toulouse. SMOS aims to characterize soil moisture across the Earth all 3 days with a spatial resolution of ~ 40-50 km and already provides different products for users working on this topic. You can visit the SMOS blog at this address: HERE. Arctic region soils are critical for SMOS since their strong organic matter concentrations need to adapt the calibration of the delivered products by this satellite. Next week, the TOMCAR team will take care of installing two humidity sensors that, we hope, will allow to improve the SMOS products acquired in Arctic regions. Additional news on satellite activities in the region of Igarka are coming, namely about the DOC monitoring in the Yenisei. Article précédentJune 2: Back on the waterArticle suivantJuly 5: TOMCAR-SAT – Remote Sensing on the Yenisei !